The LTA's website is a great starting place to find out where you can play tennis but there are several other options. 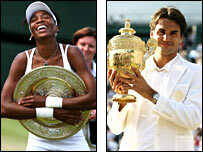 Do you want to follow the likes of Williams (left) and Federer? This is a new LTA campaign to get more people involved in the game by helping them locate a venue and find someone to play with. It also provides information for coaches looking for more people to teach. If you don't want to play at a club you can also play at local courts for free. Simply click on the map on the Tennis for Free website. In Ireland you can search the Ulster Branch of Tennis Ireland's site. For information on wheelchair tennis contact the British Tennis Foundation. If you aren't sure of your options as an adult or kid, whether you just want to play or get coaching, the LTA website can point you in the right direction.